I had envisioned me posting regular updates about stuff I see here at VMworld, but my schedule is so busy (and WiFi coverage at the Palais so crappy), that I ended up doing this first post after almost two days in my room back at the hotel. To start of with the good stuff: I have heard very interesting things today. 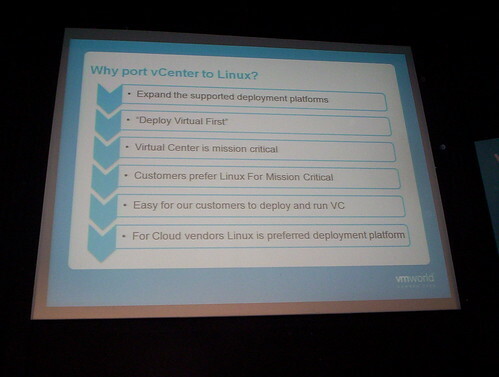 VirtualCenter (now rebranded vCenter, apparently) is in the process of being ported to Linux. It's mainly the vCenter backend that's ported, not the VI Client, but this does allow for making vCenter an appliance and running it on a *solid* platform (e.g. not Windows). The demo was very convincing. So much so even, that some wondered out loud whether a Windows version of vCenter would even be needed anymore. And the best news is, that vCenter will eventually support MySQL and / or PostgreSQL as it's database. Can I hear a 'w00t!'? Notice VMware ported vCenter to Linux because of customer demand and because people are uncomfortable with running mission critical apps on Windows. All in all good news for us penguins! Anyway, there was other news too. 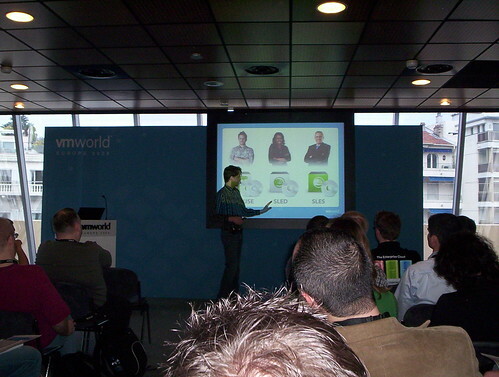 I went to a demonstration of SUSE Studio, which was actually pretty cool. I hope I get my account for the alpha version soon: I would love to try this out. SUSE Studio is a framework that lets you easily create apppliances based on either SLES or OpenSUSE. It features impressive things, like being able to set up a database with a prebuilt schema during this process, without having to actually configure the machine. It's all done for you. I've also heard VMware devs talk about paravirtualized SCSI drivers (and devices), VMkernel development, private VLAN's, IPv6 support for the whole VMware software stack (that includes the service console and the VMkernel ports, contrary to the current situation) and loads of performance enhancements for ESX. Red Hat announced RHEV a couple of days ago. And even though I remember a recent Slashdot comment saying Red Hat was leagues behind the rest of the field, I think they are just getting started. RHEV looks *really* promising to me. There have been some things that were a bit annoying here as well. As a a lot of money has been paid for me to be here, I would have expected to be able to attend every session I wanted to. Some of the more interesting sessions, however, were held in extremely cramped, small, awfully hot rooms. People were sent away because the rooms were full at more than one occasion. This was worse on Monday than on Tuesday, so let's assume the organization learned a bit overnight, but it still was pretty irritating. Major stride in becoming RHCA!